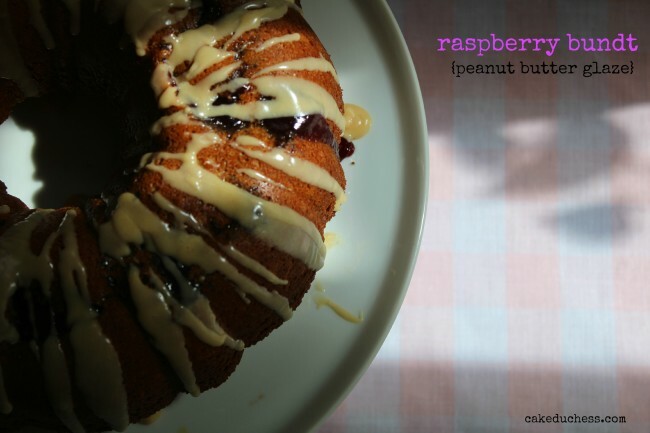 Raspberry Jam Bundt with Peanut Butter Glaze is a lovely cake to enjoy on an afternoon break. There are no baking failures in my house. If something doesn’t turn out perfectly, we will still happily eat it. I’m not talking about a pumpkin bread that has no fluff factor because it’s missing the baking soda. That goes right in the garbage. But I’m talking about this raspberry bundt with peanut butter glaze. Upon first glance, you may think it was intended to look as tempting as it does with the raspberry jam drizzling down the sides. You may think I melted a little of the jam and drizzled it on myself for the photos. I think I left the cake about 5 minutes too long in the oven and some of the jam oozed all the way to the bottom of the pan and when I flipped it out…this is how it looked. I was intrigued. I wanted to take a bite before I added the peanut butter glaze but I had to be patient. My kids, not so patient. My kids who I can’t remember when the last time they ate a peanut butter and jam sandwich were arguing over the bowl with the peanut butter glaze. Hmmm…my answer, “I thought you don’t even like peanut butter.” She doesn’t really like it. But the glaze was so good and she also thought the cake was SOOOO good even though it reminded her of a PB & J sandwich. So here is my idea for Jammy November for #BundtaMonth. A very easy and moist bundt that has a little bit of raspberry jam (was supposed to be in the middle but ended up on the top!) in it. A little bit of a peanut butter glaze drizzle…this is good. Really good! Go ahead and ask my neighbors who are huge PB and fans. They loved it! Combine first 3 ingredients in a large bowl; beat with a mixer at medium speed until light and fluffy. Add eggs, beating until incorporated. Stir in vanilla, lemon rind, and 2 tablespoons lemon juice (or limoncello). In a large bowl, combine flours, powder, soda, and salt; set aside. In a small bowl, gently combine the blueberries (and blackberries if you’re using them) with the extra 2 Tablespoons flour. Combine buttermilk and sour cream. Add flour mixture and buttermilk mixture alternately to butter mixture, beginning and ending with flour mixture. 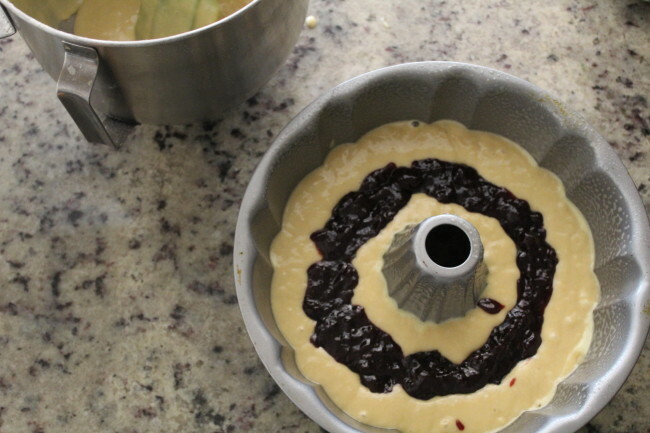 Spoon half the batter into prepared bundt pan. Spoon the jam on top of the batter, leaving a little border of batter around the sides. Spoon on the rest of the batter and smooth it out with a spatula. Bake at 350° for 55 minutes or until a wooden pick inserted in center comes out clean. Remove cake from pan; cool on wire rack. Whisk together the peanut butter glaze ingredients. Add more milk if batter is too thick a teaspoon at a time. Drizzle on the glaze. I love the ooze-y jam. 😉 And peanut butter is my weakness! Fun combination with the jam and peanut butter! What a fun Bundt! So nostalgic with the PB&J. Your daughter is too cute for words. So interesting that the jam floated up to the top. It makes for a messy-beautiful presentation. Thanks for sharing, m'lady! 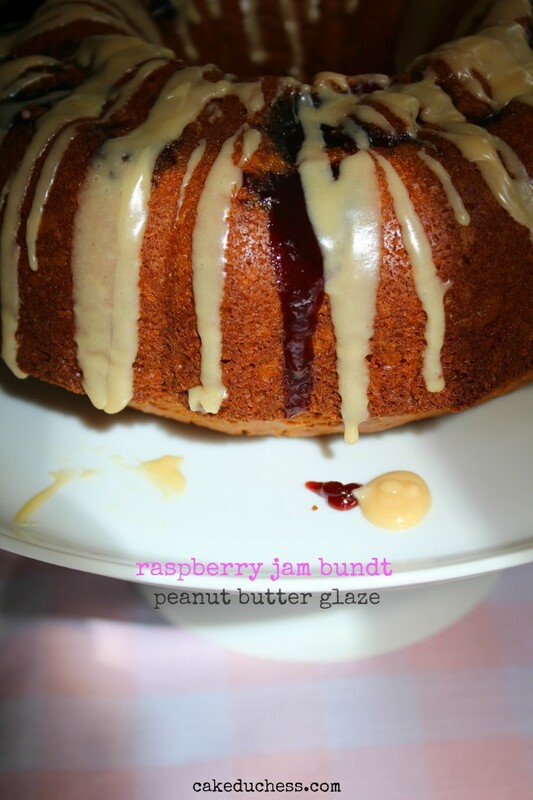 I love PB&J, what a wonderful jammy bundt! what a brilliant accident! but I would not call this an accident at all. I immediately thought PB&J when I saw this. This is freaking perfection. LOVE!!! Oh my your bundt cake looks sooo good, I love all the flavors that you have put into this. That looks wonderful, even if the jam did a little traveling =) what a great idea! What a great idea with the peanut butter glaze. 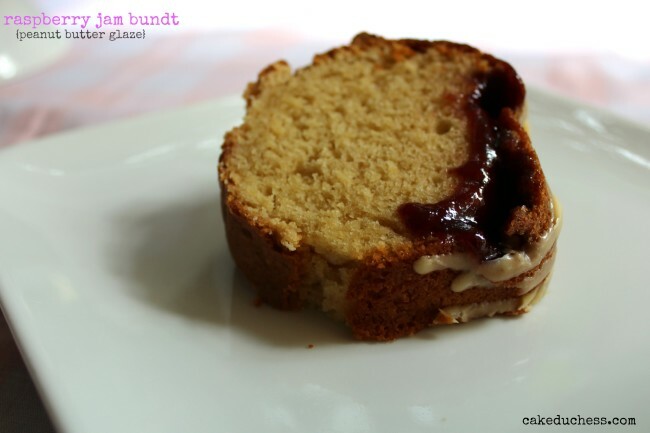 I loved PB&J growing up as a kid and would adore you bundt today!! Thanks for sharing!! If you had not said it, no one would have guessed that the jam glaze wasn't intentional. PB&J, perfect combo!! PB & J in a Bundt cake?! This sounds and looks wonderful, Lora! What a great idea. It would be a hit at my house too! Mmmmmm peanut butter and jelly. So funny that I love it now because this was not a popular combination where I grew up – I was more of a Vegemite kid, but you definitely do not want that in a bundt. I have more than made up for missing out back then, and I'm looking forward to tryin it in bundt form. Peanut Butter and Jammy cake! I love it! Smile. Sometimes its the imperfections that make a dish truly special! And this bundt cake has my name written all over it. Peanut butter and jelly will always be my favorite sandwich. Thank you for sharing Lora! I think it looks perfectly fine! But yeah, I love the idea of peanut butter glaze and now want to make it to drizzle over a chocolate bundt cake. This bundt recipe is just so versatile and can be turned into so many cakes in so many flavors! Love the peanut butter glaze with this! Delicious! Wouldn't I love to be your neighbour! !